1. 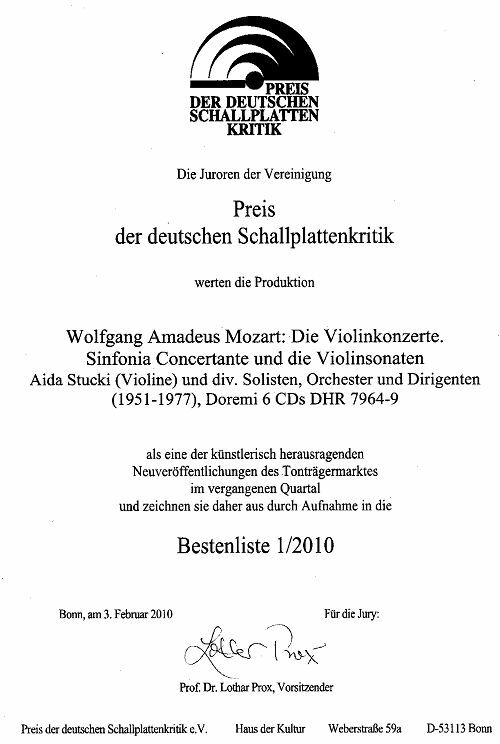 CD: "L'art de Aida Stucki"
Die CD ist im Fachhandel erhältlich, ( Distribution in der Schweiz über Harmonia mundi.). In Deutschland wird die Aufnahme von jpc (www.jpc.de) angeboten und von www.musica-schallplatten.de. Das Album kann aus dem Internet über amazon und i-tunes heruntergeladen werden. "An important first is the CD debut of Aida Stucki, born in 1921 and living happily in retirement. A Geyer and Flesch pupil and one of Switzerlands best-known violinists, she had a fine career, including working in a quartet with her husband Giuseppe Pirraccini. I heard a lot of her radio performances and they are beautiful, including this Beethoven which was taken down when she and Scherchen were performing the work a good deal. Her playing is poised and it comes through unfailingly well. Scherchen sometimes feels the need to increase the intensity at a tutti - but this is a fine addition to the concertos discography. Aida Stucki plays the Kreisler cadenzas nicely, has real sympathy for the Larghetto and is quite perky in the finale." The Beethoven Concerto (30 December 1949) passes in good sound, and it elegantly projects a performance of both power and uncanny, tender lyricism and spiritual nobility. Stucki’s tone is quite distinctive: clean, clear, birdlike and “feminine,” without affected delicacy. Somewhat reminiscent of the playing of Bustabo and Martzy, Stucki’s penetrating style might well be mistaken for the softer tissue we hear in Schneiderhan or Olevsky, if we were to ignore gender roles in music. Scherchen’s conducting is no less fiercely lyrical exalted in this, his only surviving document of the Beethoven Concerto. The periods enjoy an expansive grandeur, while the small details of half-step articulation and woodwind support in oboe and bassoon remain sutured to Stucki’s internal shifts in meter and shapely phraseology. Stucki plays the Kreisler cadenza in a broad, throaty style, the lower notes full in the manner of a spirited viola. The transition to the coda with pizzicati strings, bassoon, tympani and French horn thrills one’s sense of aesthetic closure. To fill out this excellent disc, Tahra issues the July 1953 studio recording of the Bach E Major Concerto with violinist and quartet-leader Walter Barylli (b. 1921, a contemporary of Aida Stucki), a performance in a modified “authentic” style, with harpsichord continuo. I must confess to have found Scherchen’s Bach style occasionally ponderous and heavy; but here, the collaboration reveals lithe, quick tempos and fleet, exuberant, elastic movement. Barylli’s tone evokes a well-tempered cat, a feline presence in the midst of bouncing or--in the case of the sweet Adagio--purring figures. 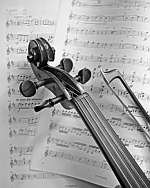 At moments, especially after a long-held pause, we feel that the music might become Vivaldi. The Allegro assai finale exudes festivity in every bar, violin and orchestra in fluent harmony, plastic and joyful at once. Diese Produktion wurde mit dem besten Preis der deutschen Schallplattenkritik 2010 ausgezeichnet. in Deutschland über www.musica-schallplatten.de in Freiburg.